Record sales months are becoming routine for Subaru here in the U.S. and around the globe. Every month, Subaru of America reports record sales of its all-wheel-drive vehicles and they have just reported that May has been an historic-high month with vehicle sales of 39,892. The all-new Forester leads the way with an increase of 38 percent over May 2012 sales. Last month we reported here that the Outback and Impreza had been the top sellers for the brand until the fourth-generation Forester was launched earlier this year. Is it just good marketing by Subaru or are there other factors contributing to the record sales? Subaru has done a great job of keeping their loyal customers happy and coming back, but they are also attracting new buyers to the brand. They have been strategic in marketing their new cars like the new 2013 XV Crosstrek to a new generation of buyers who lead active lifestyles. XV Crosstrek sales reached 5,295 for the month of May, a record high for the world’s most fuel efficient all-wheel drive crossover. The new crossover gets an EPA estimated 25/33 city/highway fuel mileage. Subaru is also launching a hybrid version of the popular XV Crosstrek that will go on sale later this year. The all-new Forester just continues to fly off dealer lots and continues to be a bright spot for the Japanese automaker. Subaru knew they had to compete with the new Ford Escape, Toyota RAV4, Honda CR-V and Mazda CX-5. So they went to the drawing board and improved everything on the Forester. Recent commercials show families utilizing the new bigger back seat and it’s also getting the attention of a new generation of buyers who have never purchased the brand before. 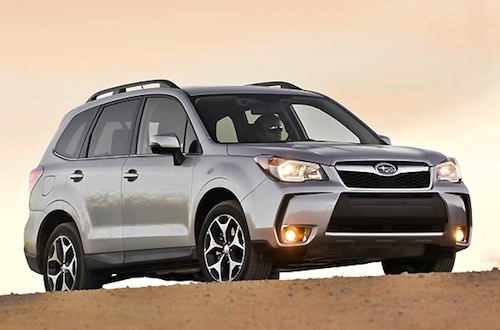 Subaru has moved into the mainstream of buyers looking for a mid-size SUV for their family. Subaru has stayed true to their core values where they have carved out a niche in the auto world. Those core values include good visibility, cargo carrying ability and versatility. The secret to Subaru’s success is that they stick to the basics and then they keep improving on them every year. The new 2014 Forester also includes Subaru’s excellent Symmetrical all-wheel-drive that gives buyers a good all-weather SUV that will go anywhere it has the clearance. The Forester also is one of the safest mid-size SUVs on the planet. The 2014 Forester was recently named a Top Safety Pick+ by the Insurance Institute for Highway Safety (IIHS). Forester is the first vehicle to ace every aspect of the challenging small overlap front crash test conducted by the IIHS. Forester is also the only small SUV to earn an overall rating of “good” in the test as seen in the video below. It looks like Subaru will see another record year here in the U.S. as the new 2014 Forester, XV Crosstrek and BRZ sport coupe drive sales. The brand is definitely doing many things right to reach these new records every month. Watch 2014 Subaru Forester small overlap safety test.